At WFUV, we love discovering new artists poised for great things. But every so often, a musician emerges that really stops the world in its tracks. Yola, the British singer and songwriter Yola Quartey, is one of those special talents. Her striking debut album, Walk Through Fire, effortlessly weaves soul, country and pop — touches of folk and blues — into a breezy, mellifluous mix. There are fleeting reminders of the Staple Singers, Dusty Springfield, the Band, and early Elton John that drift by, but what is most prominent is Quartey's vulnerability, confidence, and the versatility of her commanding voice. She's already been tapped as one of NPR's Slingshot artists for 2019 (check out Rita Houston's write-up too). The path to Nashville, where Quartey recorded the album with the Black Keys' Dan Auerbach at Easy Eye Sound studio, wasn't a simple one for the Bristol musician. She grew up in poverty and dealt with racism and misogyny, battling what she described to Rolling Stone as "patriarchal dominance" in her first band, Phantom Limb. She supported Massive Attack as a backing vocalist, began writing her own music and in 2016, released her first EP, Orphan Offering as Yola Carter. And signifcantly, she also survived a house fire in 2015 (caused by a kitchen appliance gone berserk) — which would inspire the title of her debut. Auerbach learned of Yola after seeing a video of her performing at AmericanaFest in Nashville, not long after the release of Orphan Offering. Intrigued by what he heard, Auerbach reached out to Quartey about the prospects of working together. Quartey met Auerbach at his Easy Eye Sound studio and the pair began the work on Walk Through Fire. As Auerbach did when he produced Shannon Shaw's transformative solo debut, Shannon in Nashville, he surrounded Yola with some mighty session musicians and cowriters that included Vince Gill, who sings on the ballad “Keep Me Here,” Johnny Cash's former bassist Dave Roe, fiddler Stuart Duncan, and Dan Penn, who cowrote the title track with Quartey and Auerbach. What immediately stands out about Quartey's debut album is its duality. It sounds pleasantly familiar, yet totally fresh and inimitable. Each song on Walk Through Fire differentiates itself from the next, yet the whole album flows seamlessly. The opening track, “Faraway Look,” has a sweet, late Sixties-style melody that is bolstered by a big and dramatic arrangement that includes harpsichord and strings. The title track is a country song about overcoming hardships, but also sounds a little like a long lost Staple Singers tune too. “It Ain’t Easier” is a relaxed country tune with pedal steel and fiddle and “Still Gone” delivers a finger-snapping dose of soulful pop. One of this charming album's numerous highlights, the gorgeous “Lonely The Night,” perfectly captures a heartbroken sense of solitude under a lonely, star-filled sky. It’s remarkable to hear how the pedal steel so effectively captures the shimmering of those stars. Breaking the calm, the song erupts as a full-blown epic, reminiscent of Sixties-era girl groups. “Ride Out In The Country" is a wistful summer jam that revels in the rich timbre of Quartey's voice. Auerbach's production is outstanding and Quartey's album might be his finest hour as a producer. But track by track, Walk Through Fire is owned by Yola, an extraordinary singer and songwriter who has faced a lot of obstacles in her life, yet never gave up on her goal. That conquering spirit and determination defines this impressive debut and Yola is definitely an artist destined for great things. 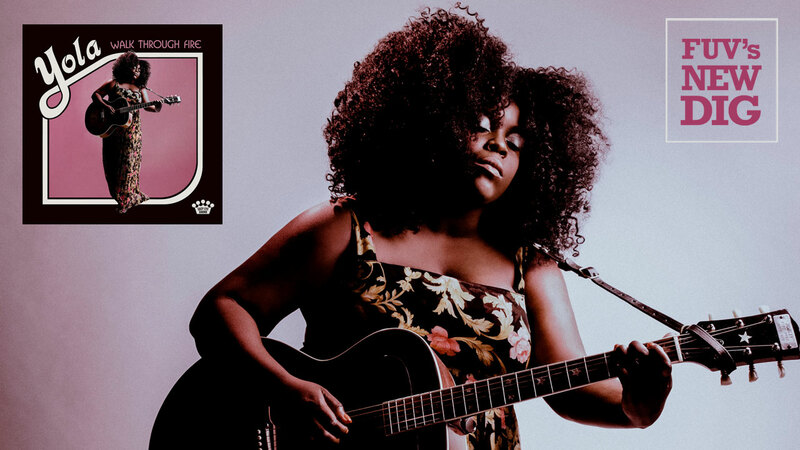 Listen to an FUV Live session with Yola on Monday, March 18, at 8 p.m. on 90.7FM and also streaming at WFUV.org.